Professional ethics and advanced clinical expertise. Profound, molecular-level understanding of blood disorders. 20 years of trust and respect. And that's just one Sponsor. We are passionate about the success of your endeavor. Because when you succeed, everyone on our team succeeds. And that success starts and ends with the astonishingly large amount of experience and knowledge PSNResearch can bring to bear on the complex nature of your business. 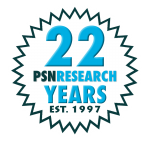 At PSNResearch, we understand the science of success.